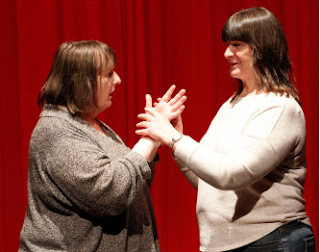 It's taken over four years and a collaboration with over twenty people for director Jodee Mundy and Deafblind artists Heather Lawson and Michelle Stevens to bring their live art performance Imagined Touch to audiences. It’s a tactile and sensory experience that explores the importance of the human touch and communication. The show begins with Lawson - who was born Deaf and lost her sight - and Stevens - who was born Blind and lost her hearing - introducing themselves to the audience and recalling how they met. As they share a few stories with us, you can’t help but start to wonder how they lead their day-to-day lives. But then the imagination becomes reality as we are suddenly immersed into their world. We remove our shoes and put on a pair of headphones and goggles. The soundscape in the headphones created by Madeleine Flynn & Tim Humphrey remove much of the sound in the room and the goggles obscure our vision, so all that we can see are bright lights and blurry shadows. I feel an immediate sense of anxiety as my most reliant forms of communication and being connected to others have been removed. I am aware of movement happening around me but I have no idea what. 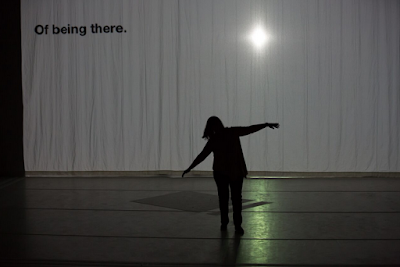 I keep reminding myself that I am in a show and am completely safe, and after what seems like an eternity of waiting (which in reality would have been minutes – I think), a hand takes hold of mine and leads me away from the comfort of my seat. I walk with confidence and trust in the stranger but the second they release me, I stop dead in my tracks. Suddenly my footsteps are much slower and smaller. My hands are outstretched in front of me as I come into contact with numerous other audience members. We touch faces, we hold hands, I feel a wedding ring on one person, and another has large, coarse hands. I am creating stories for these people I know very little about. There is a sense of timelessness while this is happening and it feels like I am in another world. Eventually we are returned to our seats and once instructed, we remove our goggles and headphones and Lawson and Stevens play out a poignant final scene to us. During these moments, I see one man reading out the sentences that are being displayed on the curtain, to a blind man. It makes me think about how accessible theatre is to the blind, deaf and deafblind and what support these people are provided in order to live their lives as freely as those who still have their sight and hearing. Lawson and Stevens remind us that going to a performance doesn’t necessarily mean watching it or hearing it. Imagined Touch challenges us and invites us to engage in the work in an unexpected way, to alter our perceptions about how to not only experience theatre, but also how we communicate with each other.